So, how do you like our new look? Push has come to shove, and it has come time to make a big change around here. The straw that is breaking the camel’s back is gas at around $4/gallon—that means our automobile gas bill is around $400 a month. OUCH! The bail of straw under that consists of things like deferred home maintenance that’s piling up, and no raises in the foreseeable future coupled with rising health care costs and paying more of our own retirement/pension costs. We have done all the pinching and squeezing on the little things that we care to do, so it’s time to change a big thing. In a healthier housing market, we would just sell our house, perhaps for a small profit, and find a closer/cheaper place. Of course, this is not a normal housing market, and so we are first attempting a short sale. The act of at least attempting a short sale, soothes our conscious that we have done everything we could possibly do to repay as much as can. If we are denied a short sale then we will proceed with a traditional foreclosure, ceasing payment and allowing the bank to sell the house at auction. We are committed to leaving and changing our financial situation for the better. At the very least a short sale will take a couple of months, more likely it will take several more months than that, if, as I said, it will even go through. I’ve heard of short sales taking up to 18 months, we probably will put up with it for that long though. I think we only have the patience to spend up to 6 months on a short sale process. A foreclosure, in California, takes a minimum of 6 months, and most often 18 months or longer. (Check out http://www.foreclosureradar.com/california/san-bernardino-county/92325-foreclosures/listings if you are interesting in this sort of thing. They have all sorts of information on the various zip codes in western states—California, Arizona, Nevada, and Oregon.) So, we do not anticipate moving in the very near future. I am not putting anything in boxes yet. However, with a move in my foreseeable future I am combing through our belongs with an eye for what I want to pay to move, and what I can now get rid of, either into the trash or off to DI or to a friend who will appreciate it more. Even, what I can put away and see if I really need to go get it in the next 6 months or so. When we do move, we will most likely move to downtown Riverside. This is where economic downturn has benefited us. Previous to this, even including much of our gas budget, we could not have rented in any safe neighborhood in Riverside for what we were paying in Crestline. Now, we will be able to rent an older 2 bedroom apartment or small home in a safe-enough-neighborhood for less than our mortgage, possibly significantly less, depending on exactly where we end up. Of course we will also save gas money and possibly some utilities money. The biggest limitation will be storage space for camping equipment and food storage. They key point is that in about six months or less we will not be paying on this mortgage. We’ll either be using that money to supplement commuting costs/utilities budget OR we will have a lower overall overhead costs. The last reason we cannot even begin to regret this move is that we have had the wonderful experience of living in the Crestline Ward for the past seven years. We will truly miss this Ward and the many many wonderful people in it. 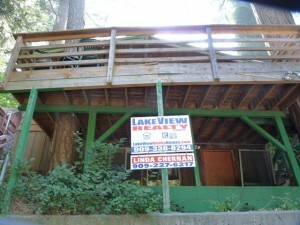 One final note–we bought our home in Feb of 2004 for about $140,000. We guess that in Spring of 2007 it may have gone for as high as $200,000. Right now the tax assessment is at $114,800 and it is listed on MLS for $72,000–there is a LOT of “deferred maintenance” . (We have a loan balance of about $110,00.) According to the public record, in March of 2000 the woman that we bought the home from bought it for $75,000. So, that’s where that’s at. Make that WOW! Lots of thinking went into that one.